Place chicken in 13X9-inch baking dish. Combine paprika, thyme, salt, and pepper in small bowl; mix well. Reserve 1 teaspoon seasoning mixture; set aside. Sprinkle remaining seasoning mixture evenly over chicken. 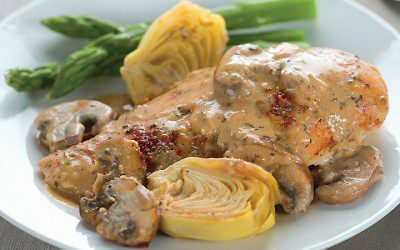 Cut artichokes in half; arrange around chicken. Melt butter in large saucepan over medium heat. Add mushrooms and reserved 1 teaspoon seasoning mixture; cook and stir 5 minutes or until tender. Sprinkle flour over mushrooms; cook and stir 1 minute. Stir in broth; simmer 3 minutes or until thickened. Stir in half-and-half; cook 1 minute. Pour evenly over chicken and artichokes. Bake 30 minutes or until no longer pink. Exchanges per serving: 2 Vegetable, 3 Meat.